Horace Pippin began to paint in earnest in the 1930s, combining the naïveté of the self-taught artist with an awareness of modern painting styles. World War I, in which he sustained a crippling arm wound, provided a frequent subject for his work, as did childhood memories and religious subjects. Human rights and social issues also often figure in his pictures, but Mr. Prejudice is rare in its overt treatment of racism. In the style of a political poster, Pippin crowds a shallow space with symbols of the division of the races. Surmounting the scene, the brutish Mr. Prejudice drives a wedge into the golden V of victory. Horace Pippin began to paint in earnest in the 1930s, combining the naïveté of the self-taught artist with an awareness of modern painting. World War I, in which he sustained a crippling arm wound, provided a frequent subject for his work, as did childhood memories and religious subjects. Human rights and social issues also often figure in this African American artist's work, but Mr. Prejudice is rare in its overt treatment of racism. In a style owing to the political poster, Pippin crowds a shallow space with symbols of the division of the races. 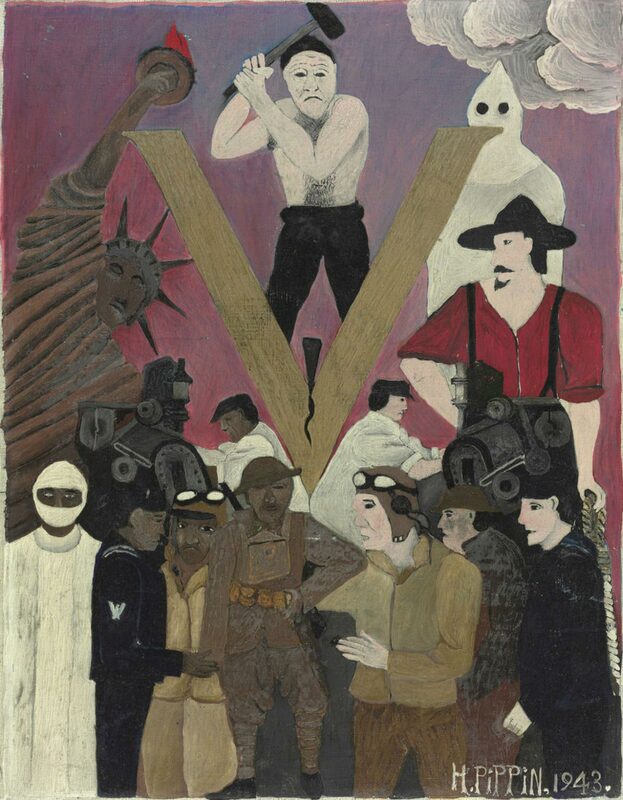 Three black soldiers (including the artist's self-portrait with his dangling, useless arm) face off against their hostile white counterparts, as a black and a white machinist turn their backs to perform identical tasks. The masked and gowned black doctor counterbalances a hooded and cloaked Klansman, while the red-shirted white man holding a noose looks across to a brown-skinned Statue of Liberty. Surmounting the scene, the brutish Mr. Prejudice drives a wedge into the golden V of victory. John B. Ravenal, from Philadelphia Museum of Art: Handbook of the Collections (1995), p. 329.